Stocks open the week in breakout mode. We’ve now taken out the December highs, the levels that preceded the sharp 20% plunge. So, now we have this chart as we enter a week with a Fed meeting on the agenda. This leaves us up 13% on the year, and with another 4% climb to regain the October all-time highs. The Fed meets this week. With a relatively light data and news week, the Fed will get plenty of attention. But remember, we know exactly where they stand. They want to maintain confidence in the economy. And they know the stock market is an important contributor (and can be a dangerous detractor) to confidence. They need stocks higher. That’s why on January 4th, the Fed responded to the plunging stock market by marching out the current and past two leaders of the Fed to tell us the “normalization phase” on interest rates was over (i.e. no more rate hikes). And that’s why on March 10th (just a week ago), in response to a 4% one-day plunge in Chinese stocks and some loss of momentum in the U.S. stock market rebound, Powell followed the script of his predecessor Ben Bernanke, and spoke directly to the public through an exclusive 60 Minutes interview, to reassure the public that the economy was in good shape, and that the Fed was there to ensure stability. If you bought stocks after both interviews, you felt no pain and have been rewarded handsomely. 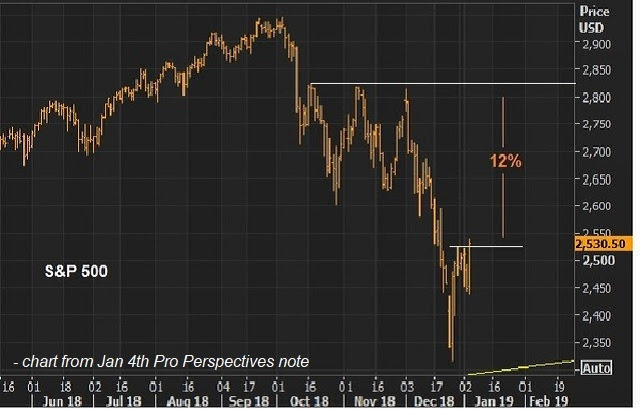 With the above chart in mind, below is the chart we looked at to start the year, as we discussed the potential for a V-shaped recovery following the Fed’s January 4th strategic pivot. “We entered the year with the idea that the Fed would need to walk back on its rate hiking path this year (possibly even cutting, if the stock market environment persisted). 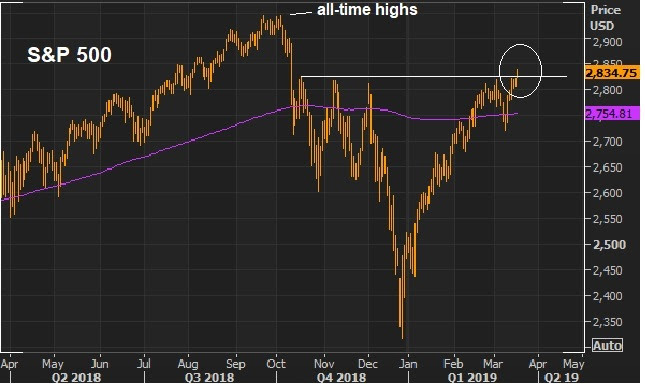 And today, just days into the new year, we get the Fed Chair Powell, former Fed Chairs Yellen and Bernanke telling us that the Fed is essentially done of the year, unless things improve … [as for stocks] We broke a big level today on the way up in the S&P 500 (2520) and it looks like a V-shaped recovery is underway, to take us back to where stocks broke down on December 3rd. That would be 12% from current levels.” So, far so good. The Fed has stabilized confidence. The question now is, do we get a deal with China soon? If not, we may find a rate cut, in the near future for the Fed. The former Minneapolis Fed president, and former voting FOMC member, is calling for a cut, as a pre-emptive strike to a slowdown.Remember, 2018 was the first since 1994 that cash was the best producing major asset class (among stocks, real estate, bonds, gold). The culprit was an overly aggressive Fed tightening cycle in a low inflation recovering economy. The Fed ended up cutting rates in 1995 and spurring a huge run up in stocks (up 36%).